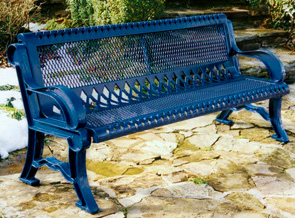 Graceful styling and contour frame gives this bench a unique look and appeal. Available in 4 or 6 foot lengths, it will fit perfectly in virtually any location. Seat made of 3/4" # 9 expanded metal with a larger diamond design pattern for added style. Thermoplastic coated for exceptional corrosion and abrasion resistance, and finished with lightly textured matte Polyethylene color options shown below. Additional modular sections can be connected together to add extra seating. 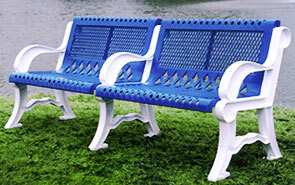 Benches can be mounted to a flat surface such as concrete or left free-standing.